Here, you're the creative chef, building your bowl exactly the way you want it from dozens of delicious options, grilled to perfection. Here, your meal is what you make it. Start with the freshest ingredients of your choice. Top them with signature flavors. Then watch us grill it up—Mongolian BBQ style—into a bowl that’s all yours. No matter what you’re craving, you’re always in control of your own, mouth-watering meal. BUILD A BOWL LIKE A PRO. We've got meats—and you've got options. We're dedicated to top quality and wickedly tasty steak, beef, chicken, shrimp, tofu, and more. Or, skip them and roll with a great veggie bowl. 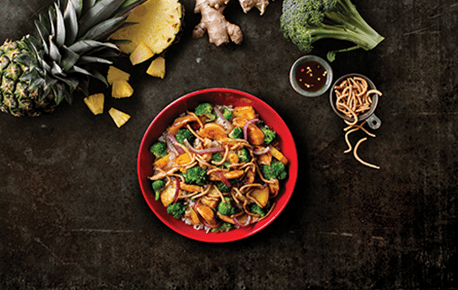 AT GENGHIS, YOU'LL FIND GREAT FOOD THAT'S GREAT FOR YOU. YOU'RE IN CHARGE HERE, SO START CREATING THE BOWL YOU CRAVE. BOWLS MADE FROM THE BEST. We're big believers that fresh ingredients are the best part of building a better bowl. Everything we source and serve is top quality, so your bowl beats every one of your high expectations.